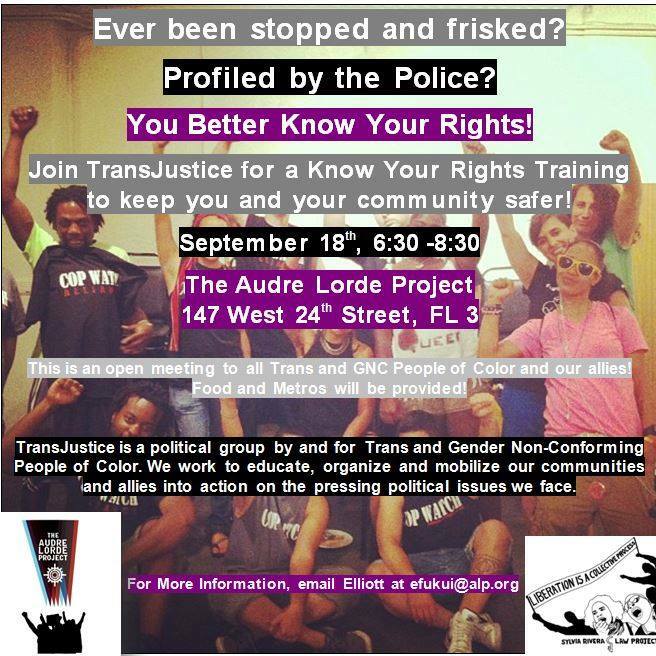 JOIN US TONIGHT FOR A KNOW YOUR RIGHTS TRAINING SPONSORED BY TRANSJUSTICE AND Sylvia Rivera Law Project (SRLP), FACILITATED BY THE LOVELY FOLKS AT FIERCE!. THIS IS AN OPEN MEETING FOR ALL TRANS* AND GENDER NON-CONFORMING PEOPLE OF COLOR & THEIR ALLIES! SEE YOU THERE!